NAMM 2017: We were impressed by Atomic's initial foray into multi-effects pedals, the original, AmpliFire, so we're pleased to see the range bolstered by two new versions: the AmpliFIRE 12 and Ampli-Firebox. The pedals offer expanded and stripped-down takes on the original concept, but both feature the same winning combination of Studio Devil modelling and the ability to load custom speaker responses. AmpliFIRE 12 is Atomic's top of the line, full-sized guitar processor. With its world-class, patented amp modelling technology from Studio Devil, professional grade suite of effects and the ability to load 3rd party speaker impulses, AmpliFIRE 12 can faithfully recreate the experience of playing through the greatest guitar rigs of all-time. 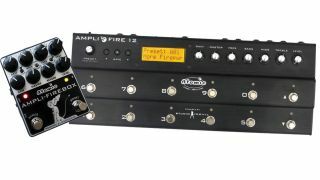 AmpliFIRE 12 builds on the success of the company's powerful and portable AmpliFIRE pedal. Both share the same amp modelling and effects processing engine, OS, editor and firmware making it easy to share sounds and presets between them. AmpliFIRE 12 increases the number of footswitches to 12, adds a larger LCD screen, 2 dedicated expression pedal inputs and a pro headphone connection. All this is packed into a custom-designed, ultra-rugged, tour ready aluminum enclosure. AmpliFIRE 12 is available now for $799.95 from Atomic Amps. With its familiar amp controls, the Ampli-Firebox distills the world's best amp modelling into an incredibly easy-to-use package in the form of a traditional guitar pedal with no display or menu system to navigate. Ampli-Firebox also includes great-sounding reverbs and extremely accurate speaker-cabinet simulations. Three toggle switches allow access to nine amps and three cabinets covering the entire spectrum of guitar tones from the beginning of electric amplification to the present. For players seeking deeper tone-shaping features, the pedal can connect to a Mac or PC via USB to customize amp slot selections from Studio Devil's entire patented AmpliFIRE series library of models, upload third-party cabinet simulations (1024-point impulse responses) and access more advanced tone-shaping tools. "Studio Devil Founder, Marc Gallo, and myself are especially excited to reach a whole new audience with Ampli-Firebox. We feel that many players have not yet embraced modeling because either they didn't like the 'all-in-one' approach of traditional modeling processors, the complex menu systems, or lacklustre sound and feel. Ampli-Firebox solves all these issues and makes it simple to sound amazing," remarked Atomic Founder Tom King. Ampli-Firebox will be available in the Spring of 2017 and will have an MSRP of $299.